“The collection of homes is truly exceptional with spectacular amenities and designs that capitalize on our panoramic views here at MacDonald Highlands,” says Rich MacDonald, president of MacDonald Companies. Here’s a glimpse into three homes. Luxurious and spacious, their attention to detail and craftsmanship make them the best luxury homes in the Las Vegas valley. “Solamere” is 6,368 square feet bestowed with marble and granite accents and intricate ceiling finishes. Built on a corner lot with a front yard casita, this estate home has four bedrooms, a gourmet kitchen with a center island, ginger glazed maple cabinetry, a large family room and an expansive game/theatre room. A spiral staircase leads to the owner suite featuring a balcony with spectacular views and fireplace. Mature landscaping adds to the backyard pool and spa, covered patio and cooking grotto. This estate is priced at $1,575,000. “L’ambiance” is an exquisite custom estate boasting an open floor plan enhanced by stone floors with inlaid designs. Measuring approximately 5,174 square feet, this four-bedroom home enjoys a downstairs owner’s suite with butted glass windows. 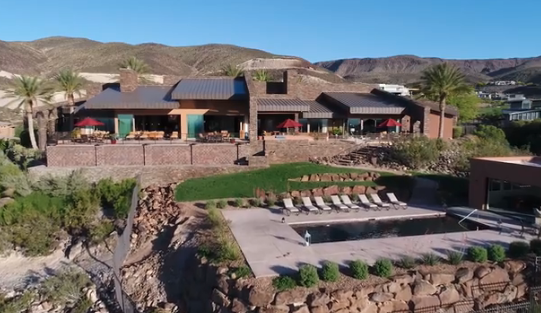 The backyard pool and spa showcases views of the 6th golf hole from DragonRidge Country Club. This estate is priced at $1,499,000. “Bella Vista” is an elegant estate home measuring 5,639 square feet with four bedrooms and an upstairs theatre. The living room, dining room and bar areas are enhanced by enticing views of the poolside backyard and DragonRidge Country Club. The luxurious owner’s suite has a private retreat which could be utilized as an office or a home gym. This estate is priced at $1,686,000. MacDonald Highlands offers custom home sites with city and mountain views, as well as views of the private Dragon Ridge Country Club. The lots within these neighborhoods range from a half-acre to over 2.5 acres. Prices start from $795,000 to more than $3.5 million. Visit our website to learn more about joining “Life at the Top” or call 702-614-9100.